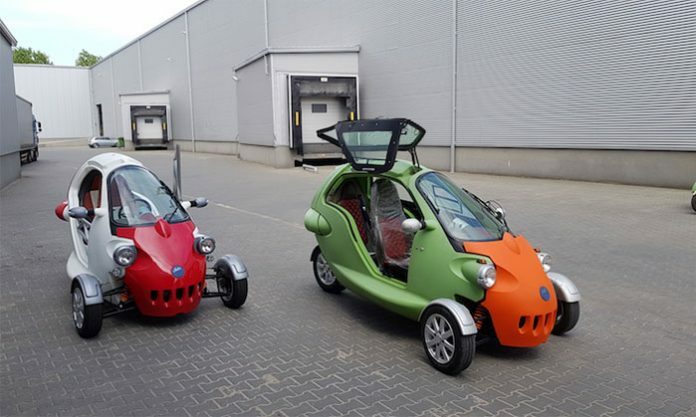 SAM is a three-wheeled, two-person, all-electric urban vehicle that is compact and environmentally friendly. Novel mobility solutions are becoming increasingly popular, especially in the developed world. It stems from a realization that our approach to commuting needs to change if we are to overcome environmental pollution and traffic congestion. SAM is a product of a daring attempt to re-imagine mobility and create a device that is compact, safe, environmentally friendly, and of course, functional. SAM combines innovative design and technology with comforting ease of use. The vehicle is basically a three-wheeled motorcycle that boasts a front and rear seat. The total weight of the vehicle is less than 1000 lbs and with a dimension of 120cm X 62cm X 62cm, it occupies much less space than a regular car. The construction is easy on the eye and SAM’s offbeat appearance serves to improve its aesthetics. It comes with an intelligent charging system that facilitates speedy recharging of the battery. The manufacturers claim that the battery charges to 40% within one hour, and to 100% capacity in a total of five hours. This allows you to cover more distance even with only a little charging time. Furthermore, the battery employs the latest technologies and has no memory effect. The recommended charging outlet is a North American standard 120V outlet. According to the manufacturers, SAM can provide a range of 60 miles or more when fully charged. Under the right operating conditions and ambient temperature, the vehicle may go as far as 100 miles. SAM’s rugged construction and simple engineering further ensure you can enjoy the vehicle under the toughest conditions and it’ll still serve you for many years with little maintenance. The top speed of SAM is 55 mph. SAM helps you navigate your city while significantly reducing your expenses. The electric nature of the car means you’ll be spending much less on fueling your car. According to the manufacturers, you can save as much as $4,695 per year with SAM. You may check out the benefits calculator to have a better idea of how much you’ll be saving when you purchase a SAM. SAM is currently available for pre-orders. The manufacturer’s suggested retail price is $9,975. Extra charges may apply depending on your location. If you wish to pre-order SAM, you’ll have to make a 100% refundable deposit of $99. Pre-ordering earns you a place among the global community of SAM enthusiasts. You can visit the official SAM website for more information.